Medicine Hat hitting coach John Mayberry sized up his new crop of players in June 1985 and he singled out returning hitter Brian Morrison, according The Medicine Hat News. "This team has a combination of sluggers and contact hitters," Mayberry told The News. "I'm expecting big things from Morrison. He should be a little more polished and more patient as a hitter." Morrison newfound polish ultimately didn't transfer to the field. He hit .238 for Medicine Hat on the year. 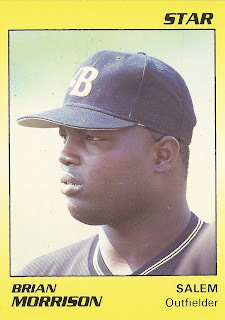 He did continue on to a career that spanned eight pro seasons, but however patient he was, he never made AAA. Morrison's career began in 1984, taken by the Blue Jays in the 10th round of the draft out of Oakland High School in California. Morrison started with the Blue Jays at rookie Medicine Hat. He hit .267 in 63 games. Morrison then returned to Medicine Hat and played at single-A Florence in 1985. He played at Florence exclusively in 1987 and hit .217. He played the next two seasons with co-op teams, at San Bernardino and Miami. The San Bernardino County Sun noted at the start of 1987 Morrison's nickname "Bam Bam" and his favorite television show, the Flintstones. Morrison started that season strong and caught the notice of his manager Rich Dauer, according to The Sun. "I was impressed with his running in right, and I think he played a great defensive game," Dauer told The Sun after the team opener. At Miami in 1988, Morrison made the league all-star team and hit two home runs in a May game. He hit .260, with 17 home runs in all. He got his first look at AA in 1989, eight games. He played the rest of the year at single-A Dunedin. For 1990, the Blue Jays traded him to the Pirates. He played at high-A Salem, then finished out the year with the Braves at single-A Burlington. Morrison's final pro time came in 1991 at AA Columbus with the Indians. He went 4 for 18 in six games to end his career.